(Dodoma) Scientists at IHI and partner institutions have shared with the government latest findings of a study on maternal mortality in urban and rural Tanzania. They urge policy makers to tackle delays at health facilities to save mothers lives. 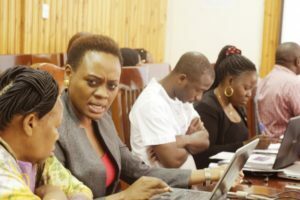 IHI Research Scientist Josephine Shabani presented findings of a study entitled: “Maternal mortality in urban and rural Tanzania” on March 28 2019 before members of the Health Services Department in the President’s Office (Regional Administration and Local Government – PO-RALG) who were led by their director, Dr. Ntuli Kapologwe. “Policy makers need to consider tackling the delay in seeking care and the delay upon arrival and receiving treatment,” she said, noting that such delays contribute to mothers’ deaths in both urban and rural areas. The study, which falls in the social determinants and health system efficiency research category, was conducted for 9 months from November 2017 to April 2018 – by four researchers: Ms. Shabani, Ms. Gemma Todd, the late Dr. Godfrey Mbaruku (all from IHI) and Dr. Anna Nswilla from PO-RALG). The researchers used the 2015/16 Tanzania Demographic Health Survey (TDHS) and the 2012 National Census to provide an overview of maternal mortalities.